Ensuring proper light and temperature is a tough job for any grower around, might be the same for you we guess. The best LED grow lights for indoor plants are one of the primers in this case. Ensuring proper growth without the sunlight vastly depends on this particular choice. For a long time, indoor growers had to depend on HDS, HIS and other artificial sources. With reduced power consumption and heat, this one comes into play with much popularity. 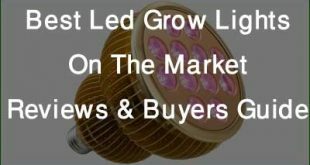 There are now several LED grow lights on the market. Reviewing all those LED lights require much time to find the most desired one. Apart from that, there are few perfected list to have your ultimate solution. To make the finding easy for you, we narrowed the long list of available LED lights list down to 5 which you should consider for indoor cultivation. With 150 LED chips, this versatile LED light induces incredibly exterior lighting for the indoor growing plants. In fact, 150 LEDs are able to fulfil the lighting requirement in less time than others. It not only makes the operation efficient but also saves the precious energy. It includes 100 red, 35 blue, 10 white and 5 IR radiating LEDs. Delivering more powerful wavelength, it encourages the growth of plants at every stage. The red LEDs are essential for flower plants to induce the flowering. The blue LEDs have 400-520 nm wavelengths to trigger the growth of plants. Again, the IR having a wavelength of 730 nm helps with plant growth. Through the red ones having 610-720 nm wavelength allows sprouting and flowering. Meanwhile, the white LEDs meet the necessity of missing spectrums. Needless to say, the white ones provide additional lux to increase the lighting intensity. Higher wattage is required when it is about indoor planting. Regarding this, EnerEco comes with a perfect LED lighting for the plants. In fact, 100 watt makes these best LED grow lights for indoor plants more convenient for different types of plants. For indoor plants, it is difficult to provide enough sunlight which directly influences the photosynthesis. Therefore, they require an extra and artificial source of light. This growth light offers a complete spectrum to deliver the most efficient light wavelength. 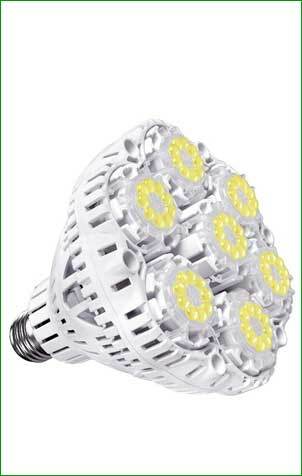 The lighting bulb is of the metallic aluminum shell which allows heat dissipation and uniform radiation. Apart from that, the heat conducting aluminum induces a consistent temperature level to ensure smooth growth and protection as well. Keeping the light at close distance is quite harmful to the plant due to intense radiation. Whereas appropriate distance triggers a rapid and healthy growth of plants. Placing this LED bulb at 3” above the seedlings and 1” above common vegetables. Not to mention, it provides 4000 to 5000 lumen to enlighten the plant. You can apply this amount of light for 8 to 12 hours a day depending on the plant type. Thus it reduces excess lighting and deters energy consumption, unlike the conventional indoor plant lights. Along with E27 universal base socket, this unit is quite easy to install. It requires the common AC85-265V input for functioning. You won’t need additional equipment to connect it with the main power supply. 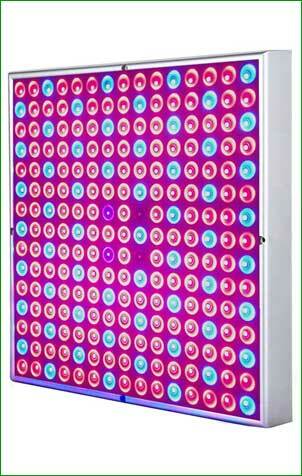 Regarding its price against service, this would be the best LED grow light for the money you can consider to choose. 150 LED chips to delivers quick and intense lighting for plants. Complete spectrum lighting intensity through 4 different LEDs. 50000 hours of lifespan to grow numerous vegetables and blooms. White LEDs of 3500-6000K is able to fill all other missing spectrums. Energy saving operation with 8 to 12 hours of lighting a day. The front LED board comes with no cover on top. There comes 78 pieces of high-efficiency LED chips to offer a full light spectrum. Through the full spectrum, it delivers a complete wavelength of light that the plants will need for photosynthesis. Therefore, it ensures a healthy growth of indoor plants without any sunlight. The effective LED chips include 42 reds, 18 blues, 6 whites, 6 IR along with 6 additional UVs. The IR and blue LEDs offer superb growth of the seedlings. In fact, their combined action allows a rapid growth through improved photosynthesis. For flowering, suitably red wavelength plays the key role. Along with 42 reds, you will receive quite faster sprouting for sure. Both white LEDs and UV wavelength work together to ensure a full spectrum. In addition, the UVs induce a favorable condition for the plants inside the house. Apart from that, it also enables you to use organic soil to produce your crops. This one from our best LED grow lights for indoor plants comes with a complete spectrum to illuminate your indoor plants. However, this MIYA lighting bulb would be the perfect solution for tropical plants. Whether it is monsoon or heavy winter, you can grow your crop inside the house with ease. Having better quality material construction, the LEDs are designed to last longer. The heating sink is of metal aluminum which delivers greater durability and further dissipation of heat. In fact, the finned sink encourages temperature consistency all the time. You can get lighting for more than 50000 hours along with the quality aluminum construction. Even if you go for full spectrum lighting in a continuous manner, the heat will remain consistent without harming your growing plants. The LED is quite bright light to work with. Especially, when the lighting angle is narrow, it may harm the plants as well as the eyes of the user. But this unit offers a broader lighting angle which does provide bright but not blinding lights. The broader angle also provides greater intensity and lighting efficiency. Though it offers half of the first LED lighting bulb on the list, yet provide excellent illumination. The lighting angle and heat intensity are satisfactory enough to get your plants a healthy growing along with sufficient light support at every stage. Metal aluminum construction offers durability and heat dissipation. Broader lighting angle to illuminate the plants encourages intensity. Very bright LED lighting without causing any difficulties for the eyes. Easy to install and simple to operate through universal design. 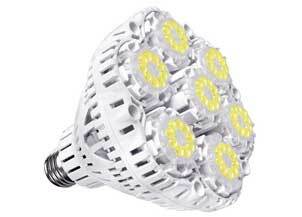 Efficient lighting for over 50000 hours along with 78 LED chips. Direct LED lighting over the plants may harm the leaves. UVs may reduce the plant growth due to closer heating. Being similar to the previous lamp, these best LED grow lights for indoor plants operates with 78 high-efficient LED chips. Along with these, you will get a full light spectrum to heat up the indoor plants. The spectrum induces a complete wavelength for the growing seedlings to encourage healthy crops. You will find 42 reds, 18 blues, 6 whites, 6 IR with 6 additional UVs contributing to the full spectrum. The red wavelength plays the key role to trigger sprouting. Through the included 42 reds, you will receive faster flowering for the plants. Both UV and white LEDs work together to ensure a full spectrum. Meanwhile, the blue LEDs with IR offer rapid growth of the seedlings. Needless to say, their combined action delivers increased photosynthesis even without the sunlight. Therefore, you can use it to grow different crops. Apart from that, the UVs induce a favorable condition for the plants inside the house. 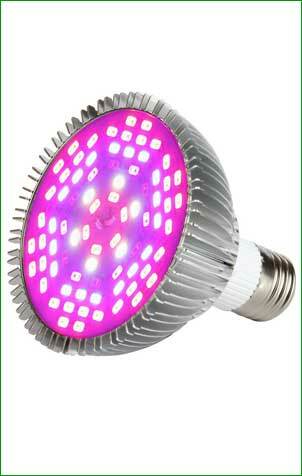 Along with this 50W LED lighting bulb, you will receive a perfect light spectrum to illuminate the plants for growth. Not to mention, this versatile Morsen LED lighting bulb is a great choice to cultivate tropical crops inside the house. You will have to handle the minimum uncertainty and effort to get the desired result even in rainy or winter season. The LEDs are designed to give optimum serviceability thanks to its high-quality construction material. Also, it can provide sufficient lighting hours. The high-quality aluminum construction can deliver consistent and intense lighting for the plants for more than 50000 hours. If you want to go for a continuous heating, you won’t have to worry at all. The heating sink is of metal aluminum which offers longer service and also, greater dissipation of heat. Thus, the finned sink design retains temperature consistency all the time. In fact, it allows the heat to remain consistent that will not harm the plants. One of the best features is its power consumption rate. Though the LEDs require 50 watts to function, the actual power consumption is far less than 50 watts. The actual consumption is equivalent to 14-18 watts at most which imply greater savings on your electricity bill. It is true that this one requires incredibly less power to operate, yet you will get excellent and satisfactory illumination. The overall design ensures a perfect lighting angle as well as intensity to trigger sufficient photosynthesis for the growing plants at every stage of its life. 78 high-efficiency LED chips to ensure a full spectrum of light. Sufficient plant lighting intensity for more than 50000 hours. Superior aluminum sink induces greater heat dissipation rate. Very easy to set and use along with E27 type base socket. Actual power consumption is quite less than the designed one. The optics may seem to be lacking for certain crops. The LEDs are not waterproof or water resistant. Having 225 LED chips, this is indeed one of the best LED grow lights on the market that induces incredibly higher lighting intensity. In fact, 225 LEDs are enough to fulfil the lighting requirement for almost all common crops which requires heavy sunlight. It makes the operation efficient and also saves electricity. 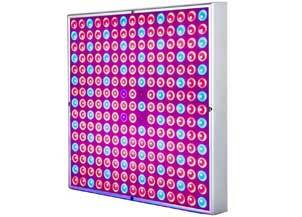 It includes 163 red, 58 blue, 2 IR along with 2 UV LEDs for effective light radiation. Providing a powerful wavelength, it encourages the growth of crops at every stage of the plant life. The higher amount of red LEDs is essential for flower plants which induce the flowering and sprouting as well. The blue LEDs come with 460-470 nm wavelengths to trigger the growth of plants. Through the red ones having 630-660 nm wavelength allows sprouting and flowering. Again, the IR having a wavelength of 730-735 nm helps with plant growth. Meanwhile, the UV LEDs with 390-395 nm meets the necessity of missing spectrums to increase the lighting intensity. This square light bulb from our best LED grow lights 2018 not just comes with a unique shape and size, it also offers an incredibly bright lighting facility for the plants. With a perfect combination of individual lights, this i-Venoya product is highly suitable for germination, seeding, flowering and vegetation inside the house. The heating sink is made of sturdy ABS plastic quality. It induces better heat dissipation while working and also, offers durability. Moreover, the finned sink allows a consistent temperature to reduce extended heating of plants. In fact, it deters heating beyond the requirement and thus keeps the plants safe from burning. The square sized growing lamp comes with a suitable design to ensure optimum serviceability. It can deliver sufficient lighting hours, thanks to its high-quality construction material. The highly conductive ABS frame can deliver sufficiently intense lighting with consistency for the plants for more than 50000 hours. This unit is quite power saving than the others on this list. Though it comes with less power requirement of about 45 Watts, it can deliver enough lighting to improve the photosynthesis. Apart from that, you can also replace with HID or HPS lights which will assert only 15 Watts. It includes an E26 universal base socket which makes this LED is very easy to set up and operate. In addition, the unit requires the typical AC85-265V input for LED lighting, you won’t have to face any difficulty to grow the seedlings inside the house without any sunlight. Incredibly higher light intensity for the plants through 225 LEDs. Unique square sized design ensures greater coverage area of 2’x2’. Minimized power consumption up to 15W with replaceable LEDs. 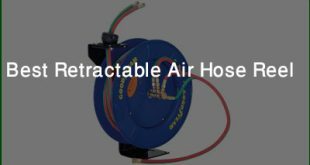 Excellent airflow and cooling facility with ABS plastic construction. Wider application for further growing tents or vegetative germinating. Poor angle might be a problem for uniform lighting. Crops requiring intense heat may not grow well. This one from our LED grow light reviews comes with an incredible light spectrum. Not to mention, each of the included LED chip contains a proper mix of different colors. Thus it enables a uniform distribution of wavelength over the plants providing a whitish glow. There comes a perfect mixture of 4 individual colors naming white, red, far red and blue. The mix is able to deliver a full spectrum like the others. The main difference is each chip has a wide wavelength ranging from 400 nm up to 780 nm to meet the demand of the sunlight for the plants and seedlings. Through the mix, the plant can get an evenly distributed spectrum for the coverage area. Thus it imparts a more natural application of light. 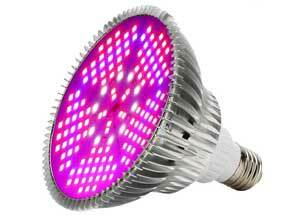 With 63 LEDs at a time, it gets you sufficient lighting intensity to ensure a healthy growth for the plants. Along with this unit, you can fulfill the demand of the lights for indoor plants in a more natural way. In fact, the mixture of individual colors rather than individual application provides a better result. The mix of wavelengths provides a uniform application of light intensity with this SANSI lighting bulb. Unlike the aforementioned ones, this one comes with neither aluminum nor plastic construction. Both of these are sufficiently non-conducive for heat dissipation. Rather these best LED grow lights for indoor plants come with suitable ceramic construction. Needless to say, the ceramic provides some greater efficiency than aluminum to some extent. The ceramic is higher non-conducive comparing to the aluminum. It allows the LEDs to dissipate more heat with enhanced intensity. Apart from that, you will find it easier to install the LED chip inside the ceramic than others. Also, the ceramic makes the chip free from unexpected adhesion which extends the lasting life for the growing lights as well. This LED lighting bulb comes with an E26 universal base socket which makes it suitable for household purposes. Being easy to install and operate, it requires less effort to heat up your plants. Not to mention, you can connect it to the main supply without requiring any additional modifying tools thanks to its input power requirement of AC85-265 Volts. Having ceramic construction, this unit has fewer modules than conventional or aluminum ones. Therefore, it requires less energy to produce the designed amount of heat. The non-conducive ceramic provides further heat dissipation with less power consumption. And you will enjoy enough savings for your electricity as well. The enhanced heat dissipating for plants with ceramic construction. A mixture of 4 individual lights emits more natural illusion. Greater application of light through uniform wavelength. 63 LEDs require less power of about 40 Watts to function. The larger coverage area of 4.2 square feet mounted at 18”-24”. Plant growth is likely to reduce due to close lighting. The blub may seem to be a bit bulky for E26 sockets. 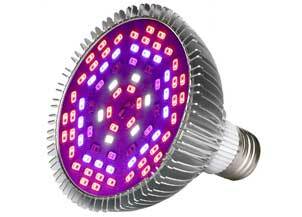 Choosing the best LED grow lights for indoor plants is quite important regarding the proper growth. If you choose something that provides intense lighting, then your plants will burn and die out pretty soon. This is why you have to be careful when you want to get one. There are some certain considerations you need to look at while buying a growth lamp. Available Space: You need to have an idea about the space you would like to cover with your LED lights. Each light comes with a maximum space to cover, you have to understand the measurements as well. You also have to measure the available height over the surface. Durability: Durability of any product depending on the construction material and your use. You need to ensure a gentle application of light which will enhance the life for sure. Apart from that, aluminum or ceramic lights are quite high non-conducive which also contributes to the durability. Cooling System: LED lights are quite cooler than their HPS or HIS counterparts. Yet you need to have a high-quality cooling facility. You should check out the heat sink within the system. A perfect one will dissipate and move the heat away from the plants and the users. Plant Varieties: You have to decide which plant you want to grow inside the house. Obviously, different plants require different heat and light intensity. So, you have to find something elegant that will fulfill the demand of your plant. Color Spectrum: In the primary stage, plants require red and blue spectrum for growth. 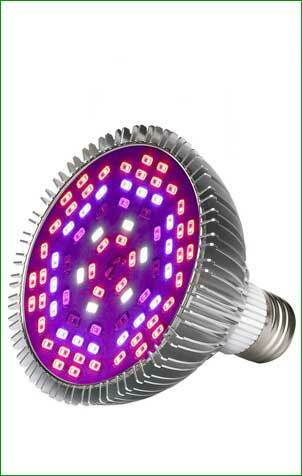 A good LED system includes red and blue lights which induce a perfect blend for the growing plant. But try to avoid the white LED as much as possible. Though white ones are very close to natural sunlight, it contains green and yellow spectrum which cause disturbance for photosynthesis. There are some reasons why people prefer to use LED lights for growing indoor plants. LEDs are highly energy-efficient lights that can last for about 50000 hours. It will take 11 years to finish in case of 12 hours use each day. These types of lights can be connected with the regular sockets and you won’t have to go for any individual ballast. You can customize the LEDs to emit a specific light wavelength. Therefore, you can adjust the color to suit any particular plant. Containing no harmful mercury, you don’t need to dispose of the light with care or special precaution. 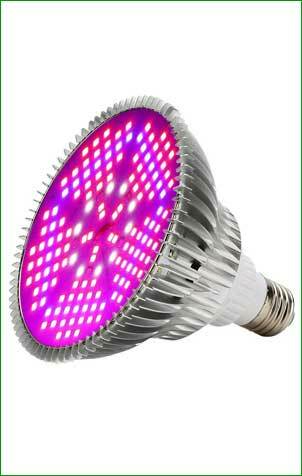 LEDs produce comparatively less heat than conventional HIS or HPS lights. It also less energy maintenance. 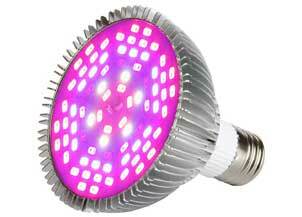 LED grow light uses Light Emitting Diodes (LED) to produce light. In fact, it requires one semiconductor and electroluminescence to generate the light intensity. It starts functioning by sending a current through the semiconductor. With sophisticated technology, various engineered parts like tiny reflectors get to amplify the light. Thus it light can attain more focus. This excites the included electrons of the bulb and emits designed light wavelength to produce the light with heat. Modern ones come with specified optics which controls the lighting angle. With a proper lighting angle, you can customize the lighting intensity along with heating. 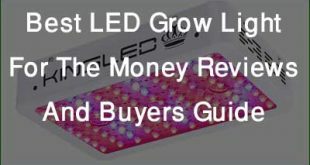 Read this articles https://gardenersyards.com/how-to-use-led-grow-lights/ to know How to use LED Grow Lights for growing the indoor plant? Going through the review will deliver you a clear idea while buying the best LED grow lights for indoor plants. The aforementioned ones meet almost all the necessary requirements you can desire. 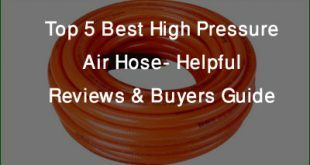 They come with rich and non-conducive material to ensure durability and safety. Though their prices are higher than conventional others, their services are satisfactory enough to front up the cost. We do believe that our reviews will help you to find a perfect light to allow a healthy plant growth for sure.